The Morro Bay Golf Course (originally called Cabrillo Country Club) was built in 1923 on a hillside overlooking Morro Bay and had nine holes that were designed by Quintin Miller and E. W. Murphy. Today these nine holes are the backside of the course. A company named J. T. Lawrence Company built the course. 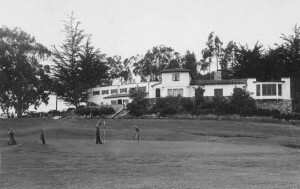 The backside was developed in 1925 as a nine hole course with the club house, an old Spanish style building, located in what is now the parking lot of the Morro Bay Museum. Originally the fairways were just wild grass, but in 1926 Bill Roy installed the first irrigation system and grass was planted on the nine hole course. In 1934 The State of California State Parks division purchased the property. Russell Noyes was the first Warden of the park, and came to take charge of it in February 1934. The family occupied the upper two rooms of the clubhouse, and the one large room downstairs was their living room as well as the lounge for the players. Mr. Noyes’ wife was put in charge of the clubhouse and Russell had the responsibility of taking care of the course, as well as the park. The WPA and the CC together planted the beautiful trees in the present campground as well as the park. Since that time the golf course has been managed by various entities, including the current manager, the County of San Luis Obispo. old number nine now thirteen old nine golf old number nine now thirteen In 1934, after the course was purchased by the state, Mr. Noyes designed (on paper only) another nine holes where the front nine is now. He envisioned an eighteen hole course to be built at a later date. Abe Espinoza was the golf pro in the mid 1940’s. His wife was the cook for the snack bar. Audrey Johns tells about Abe being a real trick artist with a golf club. He once played the whole course with a putter. Audrey had a golf lesson from him in 1947. In 1948, Albert Lape, using Mr. Noyes plans with a few changes, began building the new nine holes, which is now the front nine. In 1951 the front nine holes were completed. The new clubhouse was built using barracks from Camp San Luis Obispo. In 1957 the course name was changed to Morro Bay Golf Course. The only redesign on the course was done in 1987 on hole fifteen by Robert Muir Graves to make it a dogleg. Robert Muir Graves also designed Chalk Mountain Golf Course in Atascadero, California. The number one “must play” golf course on the central coast, Morro Bay is a favorite among seniors, juniors and anyone who want to feel they are playing a Pebble Beach-like track at a fraction of the cost. On a clear day the tree lined fairways and ocean views are stunning. This beautiful facility offers hilly terrain, placing a premium on club selection, but the real test comes in the putting. Crowned by Black Hill above and the sweeping Pacific Ocean below, Morro Bay Golf Course has a straightforward, traditional feel and a refreshing lack of manmade trickery. As you play, notice the many species of birds that call Morro Bay home, where Audubon International has bestowed Audubon Cooperative Sanctuary status on the course. (www.slocountyparks.com). In the 1940’s the women played as a division of the Cabrillo Golf Couples Club. For several years there had been discussions about the women starting their own club and in 1955 the Morro Bay Golf Club Women’s Division was founded as part of the Morro Bay Golf Club. In 1979 there was a dramatic change in the by-laws as a result of crowded tee times. The Grand Jury of the County of San Luis Obispo, a group of private citizens who monitored county issues, claimed there were too many tournaments taking place and the tournaments were being controlled by one club: The Morro Bay Golf Club. Another issue was that all the prime starting times were being controlled by one club and not leaving any prime starting times for visitors or locals who were not members of the club. It was decided that the Women’s Division of the Morro Bay Golf Club be separated into their own entity. The proposed change in the bylaws was posted for 30 days and voted upon by all members. The new bylaws were accepted and the name was changed to the Morro Bay Women’s Golf Club. In August of 1980 the club was incorporated. In 1948, golf pro Al Lape was hired. He was the golf pro for many years and was extremely popular with the local golfers. In 1970, a newspaper article said that Al Lape was the veteran pro at “Little Pebble,” having managed the course and pro shop for the past 21 years. In 1975 he was in a bidding competition to stay at the course for the five year operating concession. He was not the lowest bidder and the Morro Bay Women’s Golf Club came to his aid. The county agreed to re-open the bid procedures with a set of specifications tailor made for Lape. The fight to keep Lape at the course against four other bidders was led by Mrs. Richard Miller, president of the MBWGC. Mrs. Miller formed a group called the Friends of Al Lape, which hired a Morro Bay attorney Ray Gallo to represent the group before the board. This group of lady golfers showed up at the supervisors’ chambers in force, in numbers estimated at up to 200 with a standing room only crowd spilling into the courthouse lobby. Al Lape was awarded the concession for a few more years. old nine golf2In the late 1970’s the golf pro was Manuel Quezada followed by Tom Waters in 1986. Tom Waters had also been an actor for the previous thirty years but “Golf is my first love,” he said. “Acting is something I do because it feeds the ego,” he added laughing. Waters was a Class A member of the PGA . In 1989 Wendy Hudler was the head professional for the course and she was well liked by both men and women golfers. There was a series of golf pros during the 1990’s and the current PGA Class A Head Pro is Sean Shick. Fairway Management currently operates the Morro Bay and Dairy Creek Golf Courses for the county. Fairway management is a California based company involved in the recreation (golf) and hospitality (restaurant and catering) industries. For many years, if you wanted to play a round of golf at Morro Bay when it was the only golf course nearby this was the procedure: To get a tee time you had to go to the golf course at 4:00 a.m. and register with a volunteer who waited in a car in the parking lot. The volunteer was given the number one spot and everyone else put their name on a list. After signing up you could go home and return at 6:00 a.m. to the starter’s shack for your tee time. To get a tee time by phone you would begin calling at 6:00 a.m. for that day. All the golfers in the foursome would call until a tee time was made and then that person had to try and reach the other three who were still calling trying to get through for a tee time. (Jim and Marlene Galloway) After the opening of Dairy Creek Golf Course more tee times were available and the chances of getting a tee time at Morro Bay improved.